copyright © Tian Teck Keng Temple 2012-2019. Our Priests will perform the Special Prayers for devotees. All Devotees are welcome to participate. 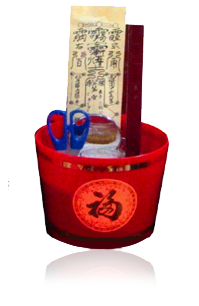 To perform this ritual, you need to set up a rice pot and in it , should contain the 5 elements of Universe; Metal, Wood, Water, Fire and Earth. Representative elements such as scissor for Metal, ruler for Wood, mirror for Water (because of it reflection like water and mercury compound), Fire from the oil lamp and Earth is represent by rice (the essential food for mankind).The oil lamp also represented the devotee personal star which is floating in the skies. After the Prayers complete at 5pm, devotees may collect the ‘Blessed rice” home for Good Luck, Prosperity and Good Health. Please register EARLY by filling the Form below and hand it personally to the Temple by hand or by Post. *After 7 days, if the “Blessed rice” is not collected, it would be donated to the nominated Welfare Home.